We’ve talked a good deal about the lounges to be found throughout Walt Disney World recently. La Cava del Tequila started the trend that has only strengthened with the additions of Trader Sam’s Grog Grotto, Hollywood Brown Derby Lounge, Jock Lindsey’s Hangar Bar, Nomad Lounge, and many others. 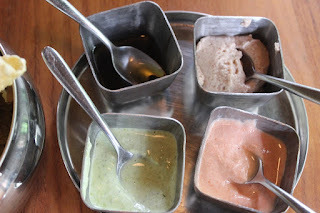 Each of these respites in the wilderness of theme park travel personifies the trend that guests are looking for craft cocktails and high caliber small plate options. Today, we’re set up with another pairing, this time from the Nomad Lounge in Disney’s Animal Kingdom. It should not come as a surprise to anyone that I chose a bourbon drink for my first taste from Nomad Lounge. The beverage menu itself is extensive and has something for just about every taste (and I know because I went to the opposite end of the spectrum after this drink), but I opted for the Tempting Tigress to start. 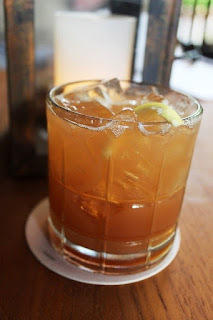 This drink is comprised of Russell’s Reserve 10-year Bourbon, St. Elizabeth Allspice Dram, Tamarind Syrup, and Lime Juice. Something about the combination of bourbon and lime has been intriguing to me recently, and this drink did not disappoint. The Tempting Tigress is a sweet and spicy concoction. The warmth of the bourbon and allspice dram make this taste familiar, even if it is a combination you’ve never tried or thought to try before. The tamarind is the only real sweet note in the Tigress, but it still makes itself known. As for the lime juice, it is the tartest element, but it plays nice with everyone else in the cup. For an accessory, I decided to try the off the menu option of the bread service, which is also available at the adjoining Tiffins. The service includes three breads (papadum, naan, and pomegranate focaccia) and four spreads (black bean hummus, pomegranate molasses and olive oil, lime chutney, and yogurt harissa). This is a vibrant selection, filled with novel tastes and inspired combinations, and I should know, I mixed every single accompaniment with every type of bread. We’ll break each one down in just a second, but I want to stop for just a minute to let you know that even though this is a delicious bread service, it does not reach the level of Sanaa’s bread service smorgasbord. 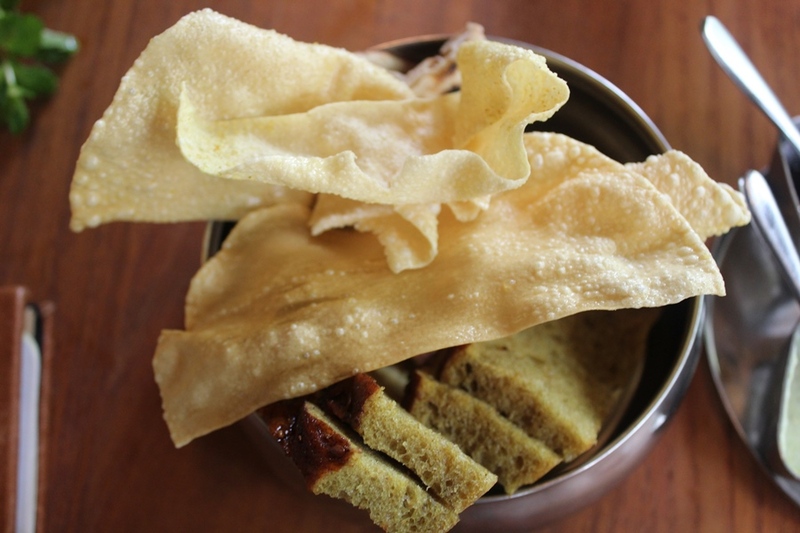 Papadum is made from chickpeas and is extremely thin and crispy when done correctly, as it is done at Nomad Lounge. Naan is a typical flatbread, and is well established on property with its variety of flavors over at Sanaa. Last, but certainly not least, is the pomegranate focaccia, the most traditional loaf of the three, its multigrain and pomegranate ingredients give it a distinctly tart flavor. The black bean hummus offers a unique take on the most popular of spreads we all keep in our house these days, it is dryer than most hummus, but has a unique flavor all its own. The pomegranate molasses and olive oil requires mixing before each use, but it is rich and biting. Next up, the lime chutney, has a zing to it that most chutneys lack in their hurry to pack in fruit flavors. The harissa yogurt is as complex as it sounds, with the cooling nature of the yogurt acting as a balm against the spicy chili flavors of harissa. My favorite combination was the papadum with black bean hummus. While there isn’t a combination I didn’t like, I would caution against combining the focaccia and molasses olive oil. The abundance of pomegranate in that grouping is, shall we say, a bit overwhelming. The unique flavor pairings in both the bread service and the Tempting Tigress make these excellent partners in crime for your downtime at Nomad Lounge. Small plates and well put together cocktails are extremely popular these days, and most evenings I’d prefer to just have a beverage on my back porch, but the lounges of Walt Disney World make it difficult to pass up their offerings. Nomad Lounge is definitely a spot we will revisit again.